Dubai: For the more than 130,000 people who descended on Abu Dhabi on Tuesday, seeing Pope Francis officiate a Holy Mass in the Arabian Peninsula for the first time is something for the history books. But for the thousands of Filipinos who were part of the crowd, the historic event did not end after the pontiff delivered his homily or the holy communion ended. Those who stayed at the Zayed Sports City Stadium after Pope Francis said his parting words were in for a mega surprise. Just as when the crowd began to disperse, The Philippines’ pop royalty Sarah Geronimo appeared on stage to perform a few songs. A lot of people in the crowd didn’t expect the box-office queen to show up, and they all broke out in excitement and disbelief. “I love you, Sarah,” shouted some of her fans. And when she sang more than one piece, some of them blurted out, "Oh my God, I thought she's gonna sing only one song." Sarah performed about eight to ten songs and donned two different designer creations at the mini-concert. Pope Francis arrived in Abu Dhabi on Sunday, marking the first-ever visit by a pontiff to the Arabian Peninsula. The United Arab Emirates is one of the leading destinations of overseas workers from the predominantly Catholic Philippines. According to published data, there are more than 500,000 Filipino expatriates in the UAE. But not everyone who travelled all the way to the UAE capital were able to enjoy the surprise performance. Carah, a Filipino expatriate based in Dubai, said she had already left when the artist started singing. "I didn't know she was going to perform. It would have been a real treat, especially after what we've been through just to be there. We haven't had any sleep, but seeing the Pope in person was still all worth it. I nearly cried after seeing him," she said. 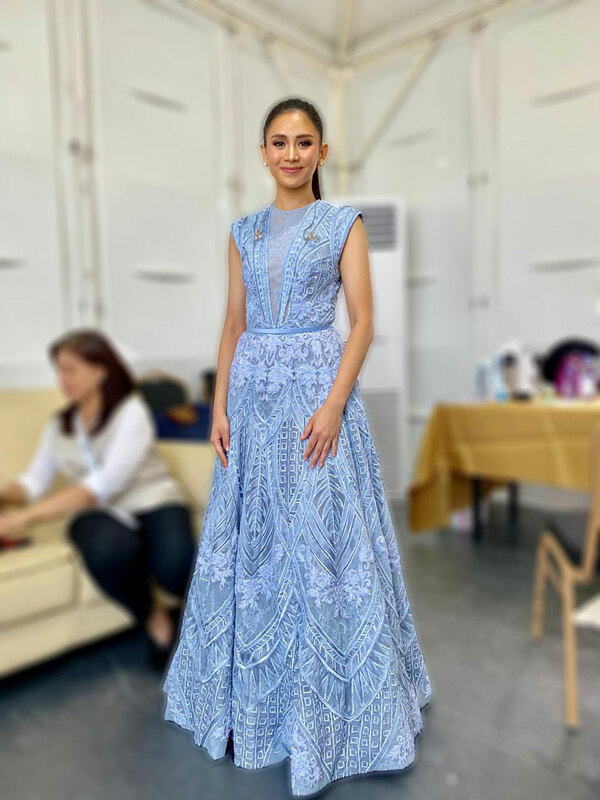 Filipino designer Furne One, the co-founder and creative director of Amato Couture, confirmed that he was commissioned to produce at least two gowns for Sarah’s appearance during Pope Francis’ visit in the UAE. “For this particular event, I have prepared two statement pieces for her; the look for the opening number is immaculate white jumpsuit in Chinese collar embellished with crystals and flower patterns finishing with a dramatic cape with aviary accents,” said Furne One. Amato had dressed Sarah in all her past concerts and appearances in Dubai in 2011, 2013 and 2018.